Mark 15:16 The soldiers led Jesus away into the palace and called together the whole company of soldiers. 17 They put a purple robe on him, then twisted together a crown of thorns and set it on him. 18 And they began to call out to him, “Hail, king of the Jews!” 19 Again and again they struck him on the head with a staff and spit on him. Falling on their knees, they paid homage to him. 20 And when they had mocked him, they took off the purple robe and put his own clothes on him. Then they led him out to crucify him. Before some of you get upset about the statement of Jesus dying please recall that I am speaking of His physical death which brings us spiritual life. As I am completing another study on the life of Christ it broke my heart this morning to read this scripture in Mark 15 and see how cruel humanity is without God. The Lord has shown me how humans are nothing more than cannibalistic animals without His Word and His spirit of peace. As you think about animals there are many different types, some that show their teeth and some that are in disguise. The ones which are in disguise are the ones that pose the most danger and this is why it wise to have the discernment between good and evil. For without your senses in tune then you never know what lies around the corner or who could be standing by your side…. Are You Drinking From The Well? In John 4 Jesus spoke with a woman at the well. This woman was a sinner and not looked favorably upon from the Jews due to her Samaritan race. This made no difference to Jesus in her background or her race for He saw a child in her that simply was in need of some relief and that was loved. As Jesus spoke with her He referred himself to living water and told her that she would never be thirsty again. Have you ever thought deeper on this message of living water? For in the living water of Jesus Christ there is a constant renewing of our minds and deepening of our souls. Like the old wine and the new fermenting wine there should be a constant cycle of transformation taking place within us that brings new life daily. Unfortunately many never get this message of daily transformation in the living water of Jesus Christ because they get to certain point and simply quit seeking and being open to receive something more of God. May I challenge you this morning to go to the well in the Word of God and seek daily for something more in the love of Jesus Christ. For the more we seek the more that we shall find when searching in the will of our Heavenly Father…. 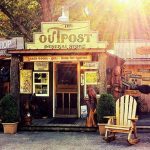 The Lord recently led me from my daily writings at BLM, to living it out in faith, at a little place on the edge of the TN River called The Outpost located in Pickwick, TN.